Five hundred ninety-six hours of work, over the course of four weeks, with 100 volunteer hours on the side: That’s how much time and energy it took to receive, judge and install this year’s “40th Elkhart Juried Regional” exhibition at the Midwest Museum of American Art, curator Brian Byrn says. This year’s regional exhibition, which stays on view until Dec. 22, showcases 203 works from 157 artists from the surrounding 22 counties in the Elkhart region. An impressive range of mediums and styles, from found-object sculpture to oil painting to the rare work with Conceptual influences, makes wandering through the show’s expansive four galleries feel like a choose-your-own-adventure of local talent. Judge Doug Calish, professor of art emeritus from Wabash College, selected 203 works from a total of 442 entered works and also administered the Best in Show award and awards for best in photography, painting, mixed media and drawing. Thirty-two pieces in the show merited a “purchase award,” an award sponsored by a member of the community — another aspect of the annual show that makes it uniquely community-driven. 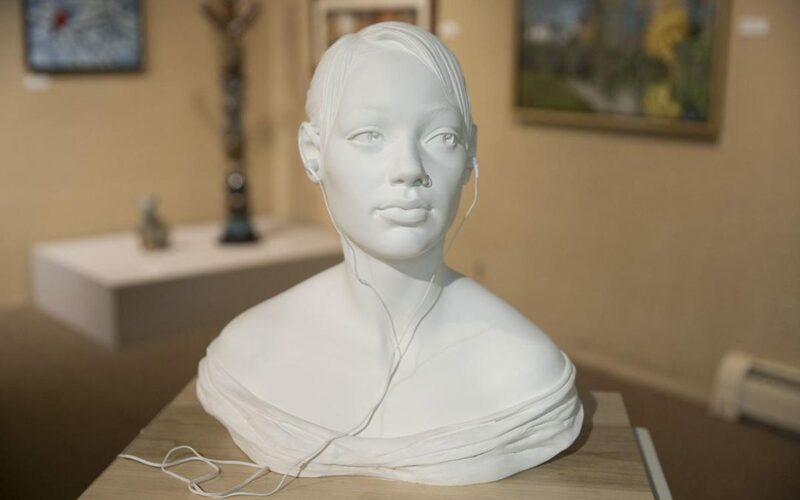 Dora Natella, an associate professor of sculpture at Indiana University South Bend, won the Best in Show this year with “Erato,” a white plaster bust of a young woman. With the swoop of bangs and the addition of a nose ring, Natella upends a classical tradition of figurative sculpture and gives it a decidedly millennial bent. Natella has playfully added headphones that plug into the wooden base supporting the sculpture, eliciting a tension between the silence of the sculpture and her lifelike qualities. With “Erato,” Natella becomes the second person to win Best of Show three times. Another standout artist in the history of the Juried Regional is Bill Kremer, a professor of ceramics at the University of Notre Dame and the most awarded artist in the history of the exhibition. His elongated “Sculptural Vessel #1,” which won this year’s Best Ceramic prize, approaches abstraction, reminiscent of an oversize vase or maybe an alien form. In “Sometimes I Cry,” Mary Amador depicts a serene young girl clutching buoys to her chest and affixes small milagros — glittering trinkets of religious devotion — to the top of the work, perhaps suggesting a link between the small physical objects of devotion and the buoyant hope — or folly — of faith. “Envision,” an acrylic painting by Sharon Chupp, casts a familiar Indiana countryside with voluminous clouds and rolling green fields in a luminous, near-miraculous composition. In his 40 years of working with the juried exhibit, Byrn, who has seen nearly every show, says that he has witnessed a strong figurative tradition persist in the region, year-in and year-out. But “the Conceptual nature of the work is getting stronger every year. So the ideas behind the work become really important. And judges respond to that,” he says. Byrn hopes not only to offer the chance to local artists to exhibit but also to facilitate community bonding among the artistic community. The show is “the touchstone for people to realize what kind of art world they live in, who their neighbors may be, for artists to connect to artists,” he says. Another gallery, which Byrn has informally called the “magic forest,” showcases a myriad of takes on the regional landscape, from realist photographs to mystical, romanticized oil paintings. Dunes, waters, city life, flora and fauna, and lake effect weather all come to bear. “You see the region unfold in magical ways,” Byrn says. “I’m trying to make sense of those parts, and also engage the artists’ imagination,” Byrn says. He hopes that through the juried regional, artists will rediscover an ever-growing community of art professionals in their region.